The Solar Lotus Leaf Water Pump Fountain is a floating solar-powered decorative fountain. Natural attractive appearance in a shape and style of green lotus leaf adds a lot of charm of wildness to a garden or pond. It is suitable and absolutely friendly for bird baths, small ponds, fish tanks, garden decoration etc. 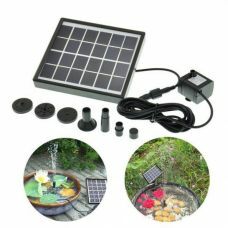 The Lotus Solar Fountain is made of highly efficient Solar Panel and new brushless pump that provides stable and efficient performance. 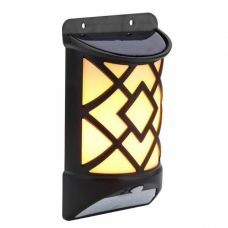 The Leaf floats on the water surface and do not require any additional batteries, wires or electric outlet. It is simple and easy to install, use and maintain. 1. 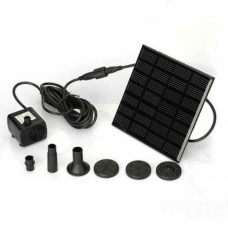 The Solar Water Pump is driven directly by the sunlight and works continuously when the sunlight is enough. The performance of the pump depends on geographical factor, weather, seasons etc. 2. 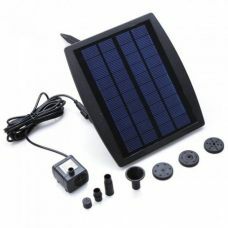 The Solar Water Pump do not suite for work without water especially for a long time. That may shortened it is life. 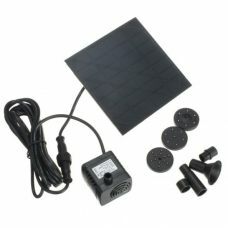 For the best performance the solar water pump must be completely immersed in water. 3. 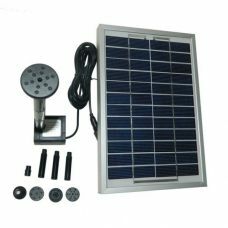 Normal working performance of the Solar water pump require to clean the pump regularly. It is also important to operate the fountain in clean water, otherwise it may cause damage. Great water lily fountain for a sunny day! After purchasing couple new lilies for my pond I can make a clear recommendation. After you have built the water lily solar fountain with all the components together (which is a child's play) and filled the small net with stones as a weight leverage, you can put the fountain on the water. Now all you have to do is just waiting for the sun! DO not worry you will be rewarded! When the sun is shining it has a nice water feature in the pond and the fish can hide well underneath. I have to say the durability is not quite as high as the synthetic leather quickly fades and hardens due to the sun. For me, based on previous experience, the water fountain lilies can be kept for about 2 years, so I you can get new once after that. For the price-performance ratio, I can only say: "Thumbs up and keep it up!" Love them in my pond! 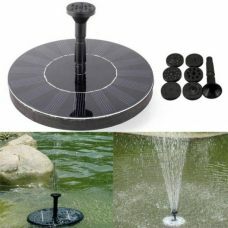 This is the best solar fountain I have found. I got 10 of them in my 1/7 acre pond free floating. The snails use them to breed and the frogs use them to get their sunning in. LOVE LOVE LOVE them! Received in time in good condition as described, it is good to do business with you. I have had this fountain leaf in my pond for ages now, only problem being that it occasionally gets blocked with algae, a quick rinse and its away again. Easy to fix. Thank you. Nice deal. Got the light few days ago. In Melbourne it works great even with less sunshine in October. Water is sprayed intermittently during day time about 1.5 meters high. The shipping was alright for this price though: got it in about two weeks time.